Cap'n Crunch's Polar Crunch appeared in grocery stores for a limited time around 2006. The cereal was made up of traditional Cap'n Crunch cereal pieces and what the box called "New Cool Berry Flavor" round pieces. 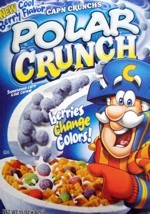 On the box, Cap'n Crunch is pictured wearing a scarf and gloves. It appeared the cereal was so cool, you needed winter clothing to withstand the enormous amount of cool. A unique aspect of this cereal was the fact that the new blue cereal pieces changed color in milk. A dusty blue coating would wash off the pieces to reveal red, green and purple pieces, changing the milk to a blue hue in the process. The cereal was said to have tasted similar to Smurf Berry Crunch, a Post cereal from the 1980's. Click here to see all cereals from Quaker. 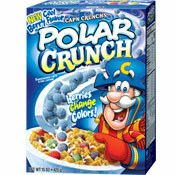 What do you think of Polar Crunch (Cap'n Crunch)? 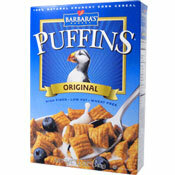 Any chance this cereal will come out again? My kids love anything that changes color in milk - totally fascinated by it. So count us in for at least one box if it comes back.